From 1990 to 1992, I lived in a world without television. The first year was in Leeds, living in student digs, getting up to speed in Chinese and Japanese. Then, I was in the Far East in the days before the internet, when a simple question and answer to distant correspondents was a two-week round trip by aerogramme. Snippets of news drifted in, spied in arcane newspapers, mentioned in letters from home. Isaac Asimov died. So did Freddie Mercury. And entirely without my realising, the Soviet Union collapsed. I got home to discover that the Cold War was over, the map had been redrawn and Red Russia had been swept away. 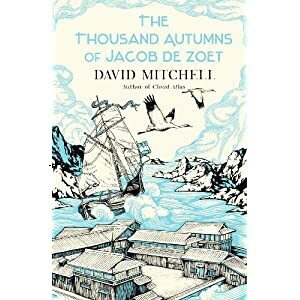 Which is why, perhaps, I feel a certain affinity for the hapless sometime hero of David Mitchell’s Thousand Autumns of Jacob de Zoet – the Dutchman who finds himself at the edge of the world, in Dejima, that foreign field that was the easternmost terminus of the great Dutch trading empire. Dejima, as prominently featured in last year’s The Secret of the Sword, was a fan-shaped island in Nagasaki harbour, where foreign devils from Europe were quarantined by the Japanese. In Secret of the Sword, it was the finish line, the protagonist’s symbol of ultimate escape. In Thousand Autumns, it is a prison in all but name, from which de Zoet yearns to fly free. It all depends on which side of the bridge you’re on. I have heard Mitchell called an acolyte of Haruki Murakami. Is this because he is the only Japanese author reviewers have heard of, or because they see in Thousand Autumns an echo of Murakami’s parallel narratives and structuring absences? Mitchell’s book is obsessed with those moments where the world can change with the tick of a clock, and in the long, seemingly eventless periods where nothing busily happens, even as the storm gathers. There are parallels, seemingly inadvertent, with today’s financial crisis, as de Zoet discovers his money is worthless, and, yes, there are echoes with the early novels of Murakami, such as Hear the Wind Sing, in which the text would curve oddly around an unspoken gravity well, daring the reader to deduce what it was. Jacob de Zoet is on Dejima, under duress, stuck with an unpleasant multinational band sailing under Dutch flags. Moreover, he is there at a crucial moment in history, when the world order of the 18th century crumbles suddenly into the world order of the 19th. Overnight, literally, at midnight on New Year’s Eve at the turn of the century, the Dutch East India Company, that association of wily merchants and privateers who had fought against Coxinga and wheeled and dealed in the China Seas, was suddenly no more. Within a generation, the Dutch in Asia were replaced by the British, commencing a whole new era in Asian history. Mitchell’s text is swimming with period dialogue and concepts, knee-deep in Dutchness, as the world de Zoet once knew is revealed to disappearing forever. And there is a romance, of sorts. There are many women in de Zoet’s life, although we only see one close up, and she is somehow beyond his reach. Sometimes, one wonders if the Thousand Autumns is not a single novel but a file containing three abortive attempts to begin. De Zoet himself is marginalised after the first third; his Dejima frustrations forgotten as Mitchell’s story takes on more fantastical elements, eschewing his pin-sharp reconstruction of Dejima for tantalising speculations about the monastery of a fictional wacko sect. Elements come to the fore of a Tokugawa-era Handmaid’s Tale, as Mitchell slaps the reader with the realisation that a heretofore minor character is far more central than one thought. It is, in a sense, a remarkably Japanese experience, confronting the idle reader with the abyss of meanings unexplored. To the attentive real-world linguist, every day in Japanese feels that way, drama or not. But this is Mitchell’s theme throughout, a surgical metaphor of trauma and healing, hinted in the opening gore of a troubled birth, and picked at throughout like a scab. None of us ever really knows which character we are truly playing, or in whose story. What De Zoet believes to be his own failings as a traditional hero are later revealed to be crucial links in a chain of events that change a number of lives. And in the final, moving time-lapse sequence, encompassing decades in a page like some prose version of the end of Zardoz, we see de Zoet getting the only reward he can expect in this life, but maybe not the next. This entry was posted in News and tagged David Mitchell, Dutch East India Company, Highlander, Koxinga, Secret of the Sword, Thousand Autumns, Thousand Autumns of Jacob de Zoet, VOC by ixarette. Bookmark the permalink.